LEXUS will launch its new CT200h hybrid hatchback in Australia by providing cars for the celebrity races at this year’s Formula 1 Grand Prix at Melbourne’s Albert Park. The company claims the races will be the first anywhere in the world exclusively for hybrid cars, although none are likely to employ the electric part of the drivetrain for anything more than trundling around the paddock. Nevertheless, an award will be presented for efficiency in addition to the overall winners. Lexus will provide 30 identical cars for the event on March 24-27, which will be followed by the official media launch on March 28. The Toyota-owned luxury brand believes the high-profile celebrity races will be the ideal way to launch its new compact hybrid hatch to a younger (under 40) and largely female target market for the car. Consequently, the 24 celebrities being chosen for the event will fall into a similar demographic profile. Lexus has contracted former multiple Australian Rally Champion and Toyota veterans Neal Bates and Coral Taylor to run the celebrity program, including driver training. The cars – 27 race cars and three spares – will be prepared at Bates’ Canberra workshop but will be maintained during the race weekend by Lexus technicians. In addition to the 24 celebrities, Lexus is running three separate competitions to fill the remaining race seats – one for consumers, one for dealers and one for people who have signed up to buy the CT200h. The Lexus-sponsored event marks the return of the celebrity races to the AGP weekend after a two-year hiatus, having previously been backed by the likes of Fiat, Mini and BMW. It also coincides with the reintroduction of Kinetic Energy Recovery Systems (KERS) to F1 race vehicles, which were used in 2009 before being dropped for the 2010 season. Introducing a Le Mans-inspired “index of efficiency” award is a first for the event and will be determined by measuring fuel use during the race. 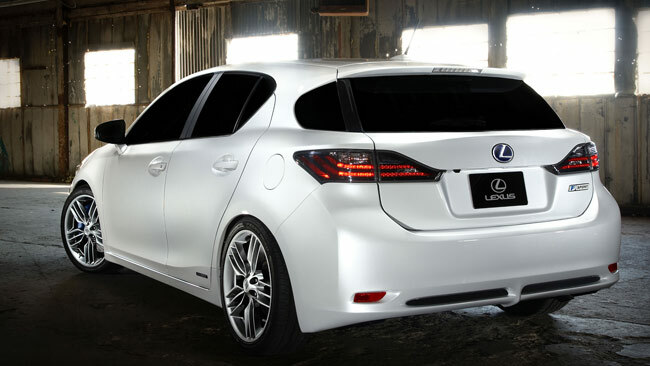 The hybrid-only Lexus CT200h is powered exclusively by a modified version of Toyota’s 1.8-litre petrol-electric drive system from the Prius.